Forum Home > General Discussion > Sticky: PLEASE - Don't quote me !! PLEASE READ IMPORTANT UPDATES ! Another bugbear I have with the forum is the inability to partially parse / edit quotes. I noticed a post in one thread, where Chris quoted Dave, quoting Simon (both in full). As my own posts tend to be rather longer, until this particular shortcoming is resolved, please may I ask that you all kindly refrain from quoting my posts in your replies. This issue never was resolved. It's another shortcoming of Webs pretty basic forum software. Yes, I myself can partially parse quotes (to a certain extent) and edit almost anything, but then I have an Admin level user ID. But one thing I still haven't figured out how to do (even interrogating the HTML code), is how to remove an unnecessary quote. Let me first define 'unnecessary'. Our little forum is quite slow moving. I quite like it that way, although I'd be happier if there were more contributors (another story). So, in normal circumstances there is absolutely NO NEED to quote the previous post when adding a new reply to an existing thread. It adds nothing to the thread; just simply repeats the text (in a reduced font size) and more annoyingly duplicates any and all photos included in it, that other readers then have to scroll though. A complete and utter waste of bandwidth. It's a common 'newbie' mistake - frequently when making their very first post. I'm not singling him out, but using newest forum member Dylan as an an example. Yesterday evening, he posted this (using the Quote & Reply button from my previous post) on page 20 of the RAF Gen. 1 thread. Dylan's actual post was the 30 or so words that I've outlined in red. My reply underlined in red includes the link to this thread. Here's how I would have preferred him to have composed his post, using the 'Quick Reply' window at the bottom of the page. Alternatively, if you intend composing a longer reply, particularly if embedding photos, click on the +Post Reply button at the top of the page, which opens a larger window. It's what I use myself, most of the time. Above is an example of a partially parsed quote, which I will use myself (and indeed have on a number of occasions). Because it involves editing the original post in HTML, to select only the phrases / part of the relevant post you wish to quote. I've simply deleted their posts (and sometimes pasted their text into my next reply). As indeed, I thought about doing with Dylan's first post, but later changed my mind. This seemingly draconian course of action likely isn't very conducive to encouraging new members to contribute further. Call me a 'Control Freak' if you like - but I've always done it in the interest of keeping forum threads looking 'clean and tidy'. The answer's simple. Just remember: PLEASE - Don't quote me !! - Nor the previous post by anybody else. 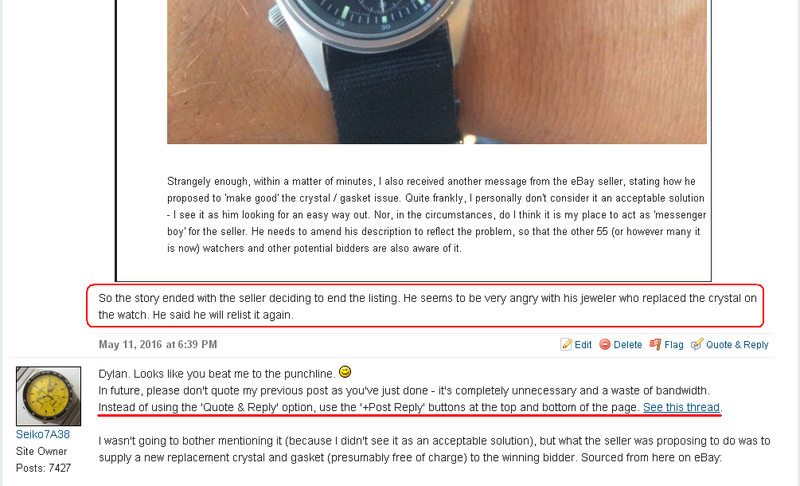 Excessive mis-use of 'Quote & Reply' has got at least one new forum banned for their troubles. See my last post in this other thread - which in hindsight, could equally have been tacked onto here. 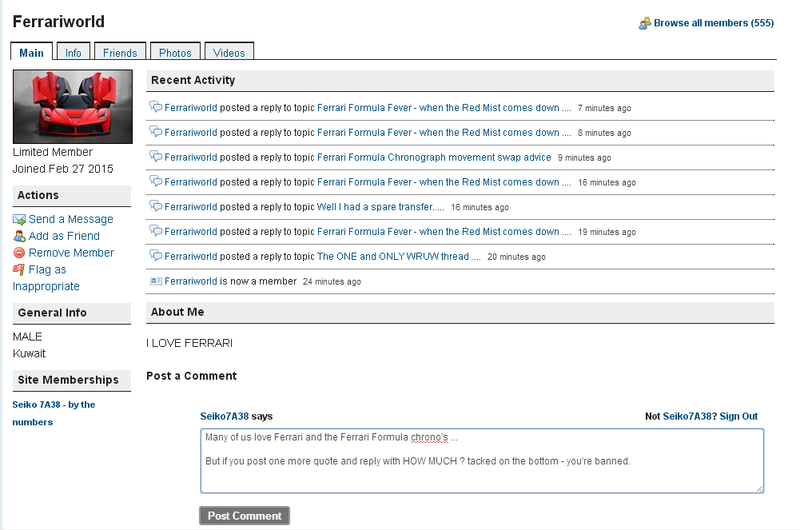 I've just deleted another potential new member - Ferrariworld. There is now another very good reason for not quoting any previous post (not just mine) that includes any embedded photo(s). I'm trying my best to repair the damage, but it's going to take a lot of time and effort on my part, before I'm finished. I'm currently working my way backwards through the WRUW thread, replacing the missing photos by editing links in the affected posts. Whereas I can fix the photo in Don's original post fairly easily, doing so will not update the blocked image in the quote. I can't edit the quote either (not even in HTML). So now we're stuck with a PhotoBucket ransomware placeholder that I can never get rid of. Could you please STOP re-quoting the previous post (and duplicating the photos). It's totally unneccessary and a waste of bandwidth. In future, I'm not going to be so polite. I will simply delete any post involving an 'unnecessary' quote which includes any photo. Persistent repeat offenders run the risk of getting banned. I've got enough on my plate already, clearing up the existing mess. In fact I've made this mistake myself, on a number of occsions, in posts all over the forum, with the best of intentions at the time. For example, here's a simple 'quote and reply' I did at the top of page 2 of the Citizen Cal. 35xx thread back in April 2013. The quote included the 2 embedded eBay images from Arpad's original post, which have since been blocked by PhotoBucket. The forum software automatically starts a new thread / topic page after 19 replies (20 posts per page), so naturally being aware of this, I quoted Arpad's post at the bottom of page 1, to carry it forward to the next page, where I intended to post my reply. It worked fine at the time. 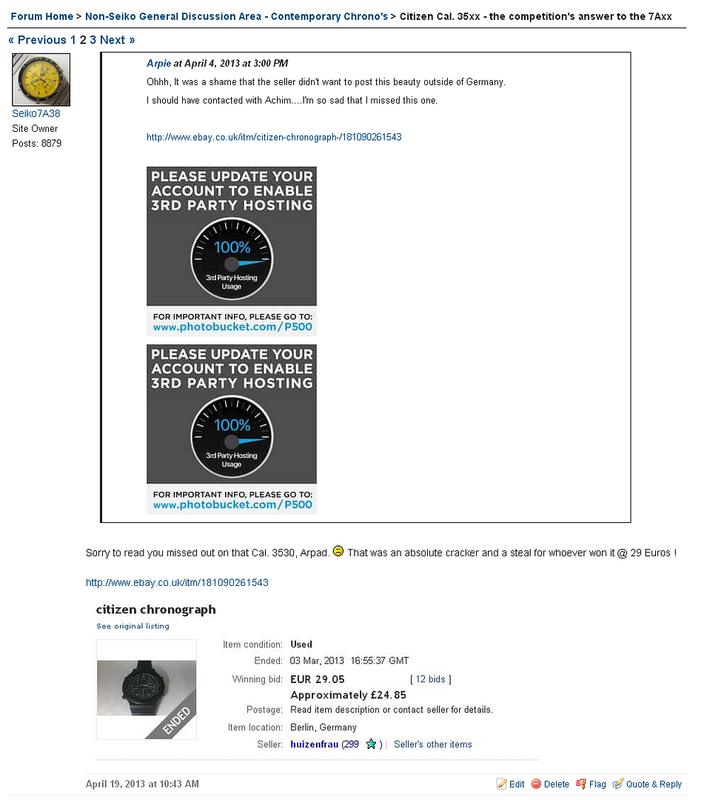 For what it's worth, I've just 'fixed' Arpad's two missing eBay images in his post at the bottom of page 1 of that thread. Of course my doing so doesn't make any difference whatsoever to the quote I made 4 years ago - and thanks to the limitations of Webs software I cannot edit (or remove) a quote. So we're stuck with that one ! For the Nth time, will you Newbie members PLEASE STOP needlessly quoting the immediately preceding post - Mine or anybody else's !! It adds nothing to the thread but absolutely unnecessary duplication ! !